You are here: Home / Money / Business / Labor Day, Americans Workers Can Be Proud: The Economy is Strong. (ThyBlackMan.com) For the first time in years, American workers will be celebrating Labor Day knowing that we finally have the economic wind in our sails. Despite what liberal pundits on TV might try and spin you, President Trump’s economic policies have paved the way for lower unemployment, a return of quality American jobs from overseas, and a confident American consumer with strong purchasing power. 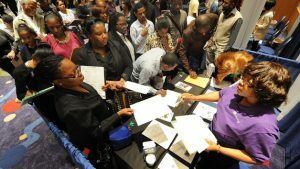 In July of this year, the U.S. jobless rate fell to 3.9-percent. This drop in unemployment means more American workers are finding jobs that will allow them to support their families and contribute to our growing economy. To illustrate just how far we’ve come, in July of 2008 the national unemployment rate was 5.8-percent. By July of 2012, just 7 months into President Obama’s second term in the White House, the rate had increased to 8.2-percent. Economic indicators have shown us that the U.S. economy grew at 4.2-percent in the 2nd quarter of 2018, having been revised up from the original estimate of 4.1-percent. The U.S. economy is the strongest it has been in four years. The Atlanta Fed is predicting the possibility of hitting 5-percent GDP growth in the 3rd quarter (July – September). Strong consumer and business spending, spurred on by the Trump tax cuts, are helping to drive the economy forward. And with our stronger economy comes an increase in consumer confidence. The month of August saw consumer confidence rise to the highest it has been in nearly two-decades. The increase in consumer confidence means more Americans are working and able to purchase those big-ticket items like automobiles and new homes. While we have much to celebrate this Labor Day, we need to ensure that we continue to build on the fruits of our success. This means remaining committed to growing our economy and removing and preventing regulations that are harmful to small businesses and consumers. Red-tape and regulatory roadblocks can still be found throughout our government — at agencies like the Environmental Protection Agency (EPA), the Department of Health and Human Services (HHS), and the Consumer Financial Protection Bureau (CFPB). To reign in rogue agencies, political careerists, and excess regulation it takes strong leadership. For example, prior to Mick Mulvaney’s arrival at the CFPB, the Bureau was used for years as a tool to advance the liberal agenda of Senator Elizabeth Warren; and as a political operation to prepare former Director Richard Cordray for a run for Ohio Governor. Thankfully, Mulvaney has been successful in implementing agency reforms to end the nearly decade of waste, fraud, and abuse that occurred on Cordray’s watch . Hopefully soon, the Senate will have an opportunity to continue to demand accountability of the CFPB by confirming Kathy Kraninger, President Trump’s nominee to lead the Bureau. Ms. Kraninger is an experienced and capable leader who has demonstrated a commitment to efficient and limited government. My hope is that she can continue Mulvaney’s work of returning the CFPB to an institution that abides by our Constitution and serves consumers by ensuring that they have access to financial services and products to make wise money choices, which leads to personal financial success and bolsters economic growth. An article like this works well with the uneducated and the uninitiated but not with me. I know that those who own and control most of the money that invests in businesses and comprise the wages of the working people is chiefly controlled by members of the republican party. Republicans did not trust,nor fully support the policies of Barack Obama. Over a period of eight years republican party members profits dwindled during their collective economic protests against Obama. It appears that this unwillingness to work with the democratic president Obama has created economic desperation in many members of the republican party. Republicans are now anxious to increase their profits under president Trump. Trump, the amoral white supremacist has demonstrated that he is willing to eliminate many costly federal regulations negatively impacting republican profits. The economic pendulum has swung to the far right firmly in favor of the republican’s continued destruction of our environment, and our relationships with the rest of the world in the name of unbridled profits.